Exploring the question of how do we live simply? I cannot think of any examples when guilt causes long-term change. Now, if you substitute “love” for “guilt,” you have changed the story and changed the results. Much of my thinking about simplicity has brought me to the point of guilt. I have too much. I don’t need this much. I should have less. “There are starving children” type of thoughts. Now, all of that is true, but how long will it impact me? How long before guilt leads to repeating the cycle? Guilt -> consume -> guilt. I had one of those moments the other day. I began running around to accomplish a number of tasks and stopped at the gas station around the corner. 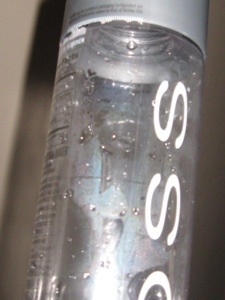 Also thirsty, I spotted a well-marketed bottle of “artesian water,” whatever that means. It looked good, it met a “need,” and I bought it. I’m pretty sure I expected the water to make me fly because of the slick packaging and price, but it didn’t. It tasted like water. It worked like water. Just like the water that was half a mile away at my house. So why did I buy the water? “There are starving and thirsty children….” Guilt. And the guilt of that one water bottle stayed with me for a little while, as in a day or two. I refrained from impulse purchases temporarily, but that won’t ultimately be a driving force for a lifestyle change. Not a healthy one, anyway. Yesterday I was working on some projects outside and had a new thought, a new perspective on my “stuff.” As a homeowner, I have often – very often – lamented my lack. This project needs to be done which will mean purchasing A, B, and C. Then I look over there and see that I need D, E, and F for that project. It takes no time at all to have an alphabet-full list of needs for my “stuff.” But yesterday I felt a moment of gratitude for all that I have. It truly is a blessing. And now that I have been entrusted with God’s “stuff,” I can make decisions about the best way to use it. Instead of guilt, I felt gratitude. Instead of lamenting what could not be changed, I was excited about what I could change. That’s the gift of grace. Jesus had it all, access to anything that we might think that we might want. And he, in love, set it all aside and gave it all away. He chose to delight in the love of God – the same love and gift that is available to us all. He took the position of a servant, giving to others in love, and washed the feet of his disciples. He offered these words after returning to the table: “I have set you an example that you should do as I have done for you.” (John 13:15) He had access to infinite love, so there was no reason to stop giving love away. He did not wash out of guilt, in love he washed the guilt away. Yours and mine. Andrew Murray, in his book Like Christ, puts it this way: “When we look upon Jesus, His obedience to the will of the Father, His humiliation to be a servant of the most unworthy, His love as manifested in the entire giving up and sacrifice of Himself, we see the most wondrous and glorious thing heaven has to show; in heaven itself we shall see nothing greater or brighter. Surely such an example, given of God on very purpose to make the imitation attractive and possible, ought to win us.” Attractive and possible. God’s love IS attractive. And we are shown that it IS possible. So we should go and do likewise. I’m glad that this came to me early on in my meditations on simplicity because it should shape all the rest. Rather than recklessly discarding all that I see as “excess,” I now have the opportunity to look through the lens of love. The lens that reveals to me just how much God loves me, and you. The lens that reminds me of the promise for Living Water which always satisfies, not artesian water which lasts an hour. The lens that shows me the truth of Jesus, the love of Jesus, the attractiveness of Jesus, and the opportunity to imitate Jesus. The search for simplicity may pass through the valley of guilt, but I hope that is only a brief passage for you. Because where we arrive – always arrive – on the other side of that, is in love. I pray that today you will see your blessings as blessings, and you will feel compelled to do as Christ did and love others. I would truly like to believe that my desire for simplicity is not only related to laundry. But I’ll be honest – that’s a big factor. Having three active sons and myself has, on occasion, led to a mountain of laundry. A clean mountain, mind you, but an unfolded and unpressed mountain. And the cycle continues – and worsens. 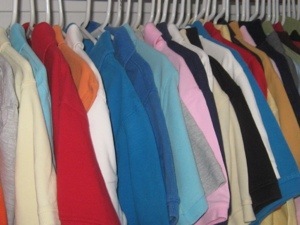 Since those clothes are readily available for wearing (at least not with my disdain for wrinkles), other clothes are pulled out of the closet, worn, washed, and added to the mountain. Where did all of this come from? I know that laundry is not my only driving force for simplicity. The book Affluenza, based on a PBS documentary, is an excellent read and one that I highly recommend. If it doesn’t challenge your mindset and lifestyle, you either have figured it all out already or you are drowning in stuff. Another book, Seven by Jen Hatmaker, is one that I have picked up because it caught my eye. She goes through an intentional process of simplifying different areas of her life. My recent trip to Honduras was also very impactful. How is that I can be more content and at peace when I have less of my own “comforts”? That is a question that bears asking. I did not like the week when I returned home – at all. Call it reverse culture shock, call it rain for five days, call it what you like. But the point was sinking in: if the comforts of life (as we call them) don’t comfort me, what’s wrong with this picture? What is wrong is that there only one comfort in life and death: that I am not my own, but I belong body and soul to my faithful Savior Jesus Christ. I believe that the Bible provides a strong basis for simplicity, and I want to seek it out. Last December I heard a message with a profound thought on the original sin. Yes, Adam and Eve disobeyed a command of the Lord. Yes, they engaged in the knowledge of good and evil. But what they were really doing was this: taking something more than what God said they needed. Perhaps the tree contained no knowledge, but the action revealed within their Spirit the knowledge that they had done wrong. We know, don’t we? We are not Jesus, but we are called to live as he did. And what I see when I look at his life is one that fully relied on God for all things, including any need for consumption. The straw that broke the proverbial back for me was this email advertisement I received: “Fill your closet with fashion and the world with hope.” In other words, “Doug, buy some name-brand things that you don’t need, and we will make a small donation from our profits to different agencies.” Sounds honorable, right? And yet it is so absolutely backwards! The only hope that we can offer the world is that they can place their hope in God, and I am certain I cannot buy that. Now to begin the journey from independence to dependence. I hope you come along.